You can allow people to choose what departments and positions that they serve in. This is great, but there may be some departments, sub-departments or positions that you don’t want to allow your volunteers to assign themselves to. For example, you don’t want a volunteer to assign themselves as Worship Leader if they just joined the team, you would normally have a process they would go through. When they are ready, one of your administrators can assign them to the Worship Leader position via the Admin Area. 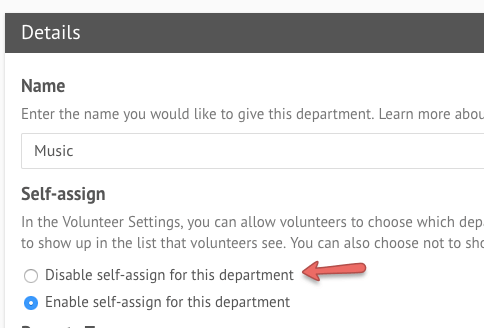 This is why we have a feature to allow you to disable volunteers from self-assigning themselves to certain positions. There are a few ways to do this. First, go to Settings and once the page loads, select People. Alternatively, there might be certain sub-departments you want to disable from being displayed to volunteers. To use this feature, simply click the pencil icon next to the sub-departments name to open the “Edit Details” window. 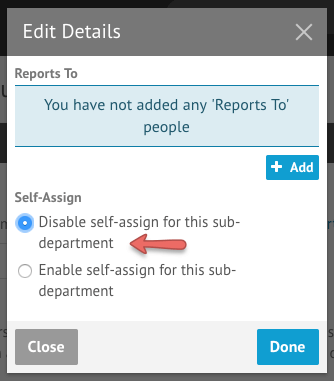 In the “Edit Detail” window you can select the “Disable Self-assign for this sub-department” option. Lastly, you can disable certain positions for being disabled to volunteers. To use this feature, simply click the pencil icon next to the positions name to open the “Edit Details” window. In the “Edit Detail” window you can select the “Disable Self-assign for this position” option.